NORTH BAY, Ont. – The Windsor Spitfires got goals from five different players Thursday night in skating to a 5-2 Ontario Hockey League victory over the North Bay Battalion. 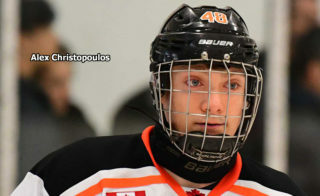 Cole Carter and Cristiano DiGiacinto each recorded one goal and one assist and Aaron Luchuk, Christian Fischer and Luke Kirwan also scored for Windsor, which moved its won-lost-extended record to 7-1-3 for 17 points, two ahead of the second-place Sarnia Sting in the West Division. Goaltender Michael Giugovaz faced 29 shots. 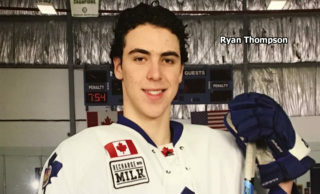 The Spitfires were without Logan Brown, their leading points producer at the start of play, who began serving a five-game suspension issued after he incurred a major and game misconduct for a check deemed interference on Bryson Cianfrone in a 4-3 overtime loss Sunday to the host Owen Sound Attack. Mike Amadio and Justin Brazeau scored for the Battalion, which lost at home for the first time in five games since a 4-2 setback to the Kitchener Rangers on Oct. 1. Goaltender Jake Smith made 21 saves before 3,124 at Memorial Gardens. North Bay is 5-5-0 for 10 points, third in the Central Division. 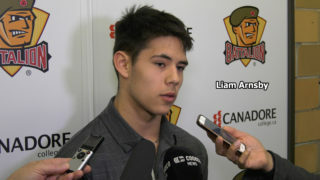 Battalion coach Stan Butler praised the Spitfires’ performance. “They taught us how to play hockey the right way. They finished all their checks. They played 200 feet. They backchecked hard. They changed properly. They blocked shots. They played hockey the way it’s supposed to be played. 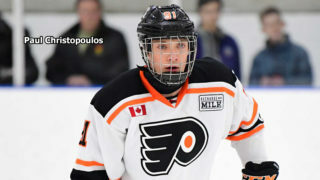 Luchuk put Windsor ahead 2-1 at 3:11 of the third period after the Spitfires won the puck on the end boards and got it out front, and Fischer scored what proved to be the winning goal on the power play 1:10 later when he tipped home Logan Stanley’s right-point blast. Brazeau pulled the Troops back within one at 5:49 with his first career OHL goal and point. Zach Poirier fired the puck from the mid slot, and the disc glanced off defender Jalen Chatfield into the air, with Brazeau able to swat it past Giugovaz. 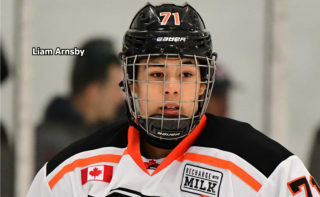 Kirwan made it 4-2 at 8:39, beating Smith between the legs on a DiGiacinto pass off a turnover, before DiGiacinto, with Smith gone for an extra attacker, connected into the empty net at 17:47. Amadio opened the scoring at 4:04 of the first period when he whipped Zach Bratina’s feed from behind the net over Giugovaz’s blocker from the right-wing circle. Miles Liberati picked up the second assist on Amadio’s fifth goal of the season. The Battalion enjoyed by far its best period, outshooting the visitors 14-8, and Giugovaz was tested by three drives from Mark Shoemaker and other shots by Bratina, Poirier and Brett MacKenzie. Carter scored at 5:39 of the second period off a power-play faceoff, getting behind defender Riley Bruce at the crease and redirecting a Stanley shot. Windsor forged an 11-7 edge in shots in the period. Smith gloved Hayden McCool’s breakaway attempt at 2:39, stopped Kirwan off the left wing in the eighth minute and grabbed Stanley’s drive in the 10th. Giugovaz had to be sharp to parry Kyle Potts from the left circle in the 15th minute and found a Kyle Moore shot through traffic in the final seconds. The Battalion visits the London Knights at 7 p.m. Saturday. The game can be seen live in North Bay on TVCogeco Cable 12 and heard on Country 600 CKAT. BATTALION BULLETS: Bratina, who saw the end of a six-game goals streak, has a seven-game points streak during which he has 11 goals and two assists for 13 points … The Battalion went 0-for-5 on the power play. Windsor was 2-for-4 … Opening line combinations featured Amadio centring left winger Bratina and right winger Mathew Santos, McKenzie pivoting left winger Mike Baird and right winger Brett Hargrave and Poirier centring left winger Brad Chenier and right winger Brazeau. 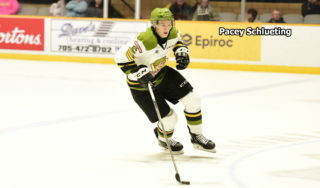 Potts centred left winger Max Kislinger and right winger Moore … The Battalion scratched Austin Kosack, Kyle Wood, David Sherman, Jacob Ball and Brady Lyle … With Sherman shelved with a possible sports hernia, Chenier was recalled from the junior A Rayside-Balfour Canadians … Amadio’s goal 14 seconds into a 4-3 home-ice victory Sunday over the Niagara IceDogs was neither the fastest opening goal nor the fastest goal at the start of a period in Battalion history. Lukas Havel scored nine seconds into a 5-3 win over London at Brampton on Nov. 21, 1999, and Matt Smyth struck at the nine-second mark of the second period in a 6-3 road loss to the Peterborough Petes on Nov. 11, 2006 … A Battalion visit to the Ottawa 67’s originally scheduled for Nov. 8 has been moved to 7 p.m. Tuesday, Feb. 9, at the request of the 67’s.